As a kid, I really loved eating ramen… Sometimes I would even eat the noodles dry as a snack. For me, it was always beef, chicken and pork flavors, either from Maruchan or Top Ramen back then. I can remember like it was yesterday begging my parents to buy it for me, but it was always so cheap, they rarely said no. 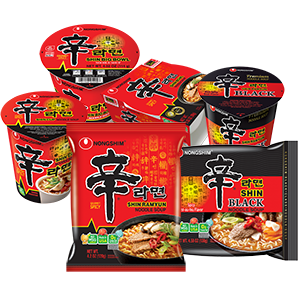 A few decades later, my youngest son introduced me to Nongshim Shin Black Noodle Soup and Nongshim Shin Ramyun Noodle Soup leaving me forever changed. They are both incredibly hearty and flavorful, with no msg or trans fats. 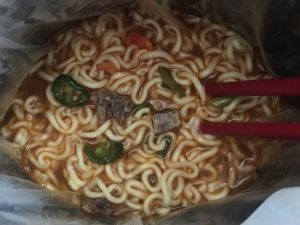 Shin Ramyun is a South Korean brand of ramen, but it’s actually made here in the USA… Lots of spice and everything nice to say the least. The Red is a little less than half the cost of the Black so I usually get the Red, but I do like the richness of the Black just a little bit more. Although, even the Red is still quite a bit more expensive than the cheap stuff that I used to eat as a kid. In my opinion, the additional cost of Red is absolutely worth every penny. Earlier this year, I went on a low-carb high-protein diet in an attempt to get my weight under control, but I still like to treat myself to a ramen from time to time. Especially if I’m on some kind of outdoor excursion. I simply enjoy it far too much to give it up entirely. Rather, I supercharge my ramen with protein-rich ingredients to fit in with my diet better. 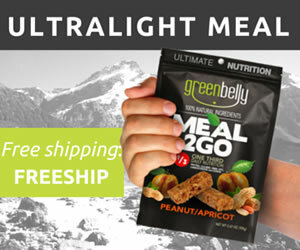 I would obviously choose fresh meat and veggies whenever possible, but dehydrated and freeze-dried alternatives are also available. I am a huge fan of pork, so it is of no surprise that the my favorite way to supercharge ramen would be to add lots of pork to it. But not just any pork… It has to be bone-in chops. As part of my diet, I usually fry up at least a half-dozen chops each week in a cast iron skillet or on my discada. I fry them in butter, with a generous amount of cracked pepper, sea salt and garlic powder rubbed in. Then I add plenty of sliced serrano peppers to give it a little kick. Sometimes I add some onion powder, cayenne or chipotle pepper, and turmeric as well. Just before the chops have cooked all the way through, I like to cut them into small 1/2″ squares, and then put them back in the skillet to finish them off. The small bits make it easy to spread over whatever it is that I happen to be eating at the time. A perfect addition to any salad, omelet and of course ramen. I also like to add some sliced carrots and chili peppers to my ramen as well. Though, most any vegetable from onions and bell peppers to cabbage and broccoli florets would also work nicely. Whenever I’m planning a trip, I like to throw some in my dehydrator so it’ll last a week or so without any refrigeration, provided that I can keep it all completely dry. 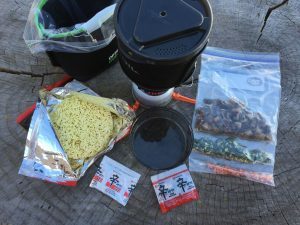 Commercially dehydrated meats and vegetables will generally last much longer than the anything that I dehydrate myself because of the preservatives. 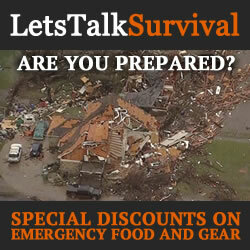 And Freeze-dried foods will often last even longer. But the homemade stuff does taste so much better as long as you eat it within a reasonable amount of time. Moisture absorbers can help, but they can only work so well if the food is not vacuum sealed. If I happen to have any flap steak on hand, well it too is an amazingly flavorful addition to ramen… And in my omelets and on my salads just the same. For this recipe, I use a dash Lawry’s Season Salt, and plenty of garlic powder and cracked pepper. I also like to add some sliced serrano peppers whenever I have them as well. The last method that I use to take my ramen to the next level is to add an egg or two. I find it adds a heartiness and rich flavor to the broth, much like an egg-drop soup. In fact, I make it in much the same way. Except that I don’t scramble the yolk. Once the noodles have cooked almost all the way through, I remove them from the broth. This is very important, or you’ll end up with a single blob of egg and noodle at the end. Once the noodles have been removed, I slowly drip the egg white into the broth, followed by the yolk. It must be done gently, making sure not to break it. When the egg is nearly poached, add the noodles back and let it simmer for another minute before removing the ramen from heat and serving. Well, I hope you’ve enjoyed reading about what I do… But I’d love to hear some of your ideas. Please leave a comment below and share with us what you do to take your ramen to the next level.